Constructive criticism is providing feedback in a manner that acknowledges both the positives and where there is room for improvement instead of solely focusing on the negatives. The focus of providing constructive criticism is offering useful advice that can be implemented for better results. Some might view constructive criticism as a form of positive feedback. The ability to provide constructive criticism is considered a leadership skill. It is said to motivate people instead of causing people to lose morale because of negative feedback. This is because properly delivered constructive criticism focuses on future improvement instead of on current wrongs. The person giving feedback offers clear steps on what can be done differently so that the person receiving feedback has a starting point for betterment. 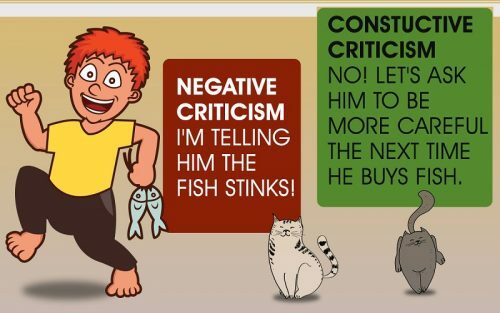 This is the vital difference with plain criticism. Giving criticism that only points out the negatives does not offer the receiver a guiding point on how to improve. Thus, negative criticism is less effective in reaching better results. Giving constructive criticism yields faster improved results than negative criticism because the receiver is given specifics on what needs to change and how to change it. A good leader will be able to use constructive criticism to carry the team forward. There is a wide variety of literature available on how to deliver constructive criticism. Here follows a few general tips on how to give feedback in a manner that is encouraging. A major part of constructive criticism is to stay positive. When providing feedback that only acknowledges the negatives, the receiver can feel discouraged and unappreciated. By leading with the positives, the receiver of feedback feels acknowledged for the given efforts. The receiver will be more likely to want to listen to feedback if it is given in an encouraging manner. A common tactic is to ‘sandwich’ a constructive comment between two positive comments. For example, start with a positive aspect of the work, follow with an aspect that can be improved and end again with a positive comment. Constructive criticism seeks to reach improved results in a shorter amount of time. Hence, the term is ‘constructive’ instead of breaking down the work based on all the negatives. It is more effective to acknowledge the lesser aspects as room for improvement because it acknowledges that an effort has been made but that the result is not yet optimal. Room for improvement is also friendlier. Receivers of feedback respond better to kind and polite words rather than harsh commentary. Though this may seem a simple case of semantics, in practice, it does make a difference. Feedback that does not offer a starting point for improvement is not helpful. Whenever an aspect of the work delivered is unsatisfactory, be specific about it and give advice on how it can be done better. This way, the receiver knows exactly what to do the next time instead of only knowing what not to do. As a leader, mastering this skill will help reach the desired results quicker because the team is given clear guidance. The receiver of feedback will be more productive when there is already a guideline in place. This final tip is related to the focus on positives. In the workplace, constructive criticism is not about the person but about the work performed. It is important to remember this in the wording and deliverance of the feedback. Getting personal when giving feedback will make the receiver feel attacked. This is not fruitful in establishing healthy work relations. Instead, use phrases that refer to the work instead of the person. Here is an example to illustrate the difference. Employee A frequently delivers paperwork with simple spelling mistakes because he forgets to go through the document twice. Manager Z could say to employee A that he seems to be too lazy to be thorough with his work. However, this is a personal criticism and does not offer a solution. Instead, Manager Z could advice Employee A to use the spelling and grammar check before delivering a document the next time. The latter option offers a solution and makes the subject matter about the work itself. There are many instances at work that call for constructive criticism. Whether there was a specific incidence or it is time for the half-yearly staff evaluation, having the skills to provide constructive criticism will improve your work relationships and add to a more productive work atmosphere. If you are still uncertain about how to phrase concerns, take a look at the following examples. A common issue between upper management and lower ranking employees is that there is a lack of communication which can lead to unexpected deadlines and last minute tasks. If you’ve experienced this, you can convey these concerns to your boss in a polite and productive manner like the example below. I appreciate your trust in me to be able to perform urgent tasks. It makes me feel like a valuable part of the team. However, I’ve also noticed that some of the last minute tasks could have been planned for ahead of time. I think that if we could set up more frequent communication between us, then we would be able to plan further ahead about what needs to be completed and when. Perhaps we could meet once a week for 15 minutes to go over all the scheduling for the next two weeks? This way we are both up-to-date on all the projects that are going on. Performance reviews are an excellent time to reflect on the productivity of the entire team. It is also an opportunity to address negative attitudes or a lack of initiative from employees. Below is an example of constructive criticism for an employee that does not seem as motivated on projects as before. You were always proactive in the projects you take on but I’ve noticed that you have taken more of a backseat in the last few projects. Has something changed over the last few months? Perhaps we could discuss about future projects that you would be more passionate about. The next few projects coming up would have even better results if you used your creative thinking. How about we have lunch together tomorrow to talk about what you are personally interested in working on. We can also discuss what role you want to take on in the project teams. Perhaps it is time for a new challenge. It can sometimes be difficult to give your coworkers constructive criticism, especially when you consider them to be your friend, as well. However, it can still be very fruitful to discuss working place attitudes with coworkers. Below is an example of how you give constructive criticism to a coworker that has been saying things about other coworkers that were offensive. Our colleague has told me what you said to her during the coffee break. I have to say that I was surprised to hear what she said. I know that you are a kind person that doesn’t intentionally offend anyone. Would you like to tell me your side of the story? I’m sure it was a simple misunderstanding but it would be a good idea for you and him to talk it over again, to clear the air. Maybe you could bring them a cup of coffee as a peacemaker? If it makes you feel more comfortable, I can come with you. 1. A manager of a restaurant sees that the new waiter does place the table cloths neatly. Which of the following phrases that the manager can use is a form of positive criticism? 2. A colleague is asked to give feedback a new blog to be published on the company’s website. The colleagues are close friends, outside of work too. The colleague that is asked to give the feedback feels uncomfortable pointing out that the blog is difficult to follow. Instead she only gives positive feedback. Is this an example of constructive criticism? A. Yes, constructive criticism is about giving negatives a positive twist. B. No, the colleague should only point out all the parts that are hard to follow but no reasons why are needed. C. No, constructive criticism offers ways to improve, too. Positive feedback alone does not give directions for improvement and so the colleague’s feedback is not helpful. 3. Why should the focus of constructive criticism be on the work instead of the person that delivered the work? A. Constructive criticism is a tool to reach better results. Giving feedback that is personal instead of about the work does not necessarily lead to improvements in the work. B. Constructive criticism can be about the flaws of the person delivering the work, too. C. Constructive criticism should acknowledge the personal flaws and how the person can change themselves so that the work will improve, too.